The IBTrACS project combines information from numerous tropical cyclone datasets. 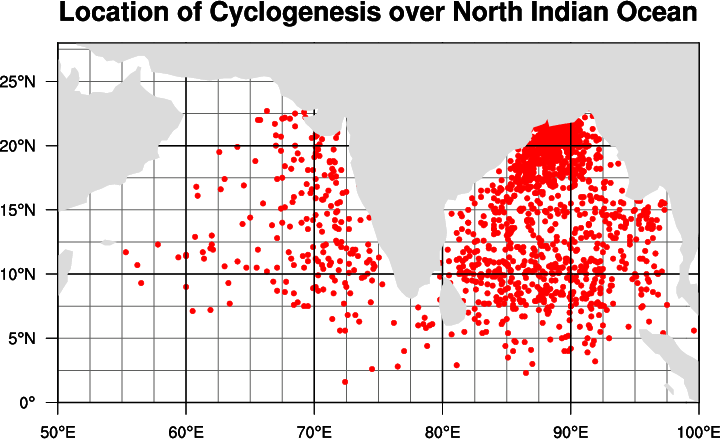 It contains the most complete global set of historical tropical cyclones available. The data are available from here . Users should perform a 'ncdump -h' or 'ncl_filedump' on the file(s) being used to become familiar with the information on the file(s). NCAR's Climate Data Guide provides additional IBTrACS visualizations. There are other examples of tracking (storm, bouy, etc.) under the trajectories category. ibtracs_1.ncl: IBTrACS for a region in 2007. Contributed by Carl Schreck. IBTrACS global for 2005. Contributed by Carl Schreck. which must be unpacked (short2flt) prior to use. These variables have dimensions (storm, time). Hence, the NCL array syntax used in the script (:,0) means all storms at time 0 (initial time). Contributed by Carl Schreck.